I must say, I have an affinity for natural/organic based product. The reason? Because in today’s world we are always, and I do mean always surrounded by pollution both internally in what we consume and externally in what we breathe and feel due to pollution in the air and sun. 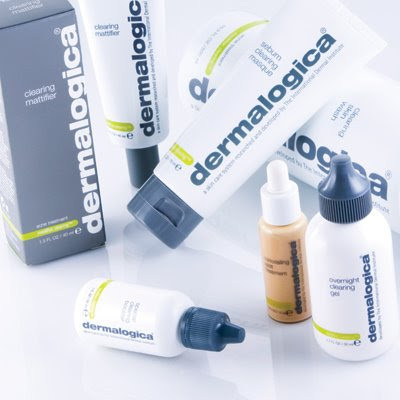 For this reason, I chose Dermalogica's Medi Bac kit. This Medi Bac kit is actually the new and improved formula of the original acne kit. It’s reasonably priced, here in Hobart Australia, it’s available for only $65 AUD (which is about RM 200) for the whole kit and it has essentially everything you need for short term or just to test the product out before buying the normal to jumbo sized bottles. Now this kit contains a Clearing Skin Wash that is 1.7 Fl Oz/50ml. Now I have to say for those who do not like the herbs smell please think twice. Though its scent is not strong, to those who are terribly particular please give some thought about whether you are able to tolerate the smell before buying the normal sized bottle. As I have a combination skin type, I say that the its both effective at the oily areas of the skin as well as gentle on the dry areas as it does not overdry the skin. This product is known to wash away excess surface oil on the skin and helps clear congested follicles as wells as calm inflammation. All you need is one pump. The second product in this kit is the Clearing Mattifier that is 0.5 FL Oz/15ml. This product is matte it nature. All you need for the whole face is less than a pea size drop. What is does it helps to control the shine of the face as well as smooths out the skin texture. It also diminishes certain fine lines (it’s not a miracle worker) and clear congestion. The third product is the Oil Control Lotion (SAMPLE). However it’s only a sample. This lotion is lovely and light oil-free moisturiser. It hydrates the skin, helps reduce shine and provides a certain matte finish. *NOTE: the matte finish of the Clearing Mattifier is the best for the matte effect. The fourth product is my favourite. It’s the Overnight Clearing Gel that is 0.5 FL Oz/15ml. Put just a little bit on the pimple whether it’s just emerging or have broken out and inflamed. It’s used after cleansing your face but before the moisturiser. Wait for it to dry out first before applying the moisturiser. This product helps to subside or dry the pimple without drying the area around it. This product generally helps to take off pore clogging cells as well as aid skin clearing. However as its name indicates it’s only to be used at night. The day treatment is the fifth product which is the Concealing Spot Treatment that is 0.1 FL Oz/3ml. This is a naturally tinted product that contains sulphur. I cannot give a personal view on this as I am allergic to sulphur. However to get around this problem I used the Overnight Clearing Gel in the day as well. What is does is dry out the pimple during the day under your make-up. The last product in this kit is the Sebum Clearing Masque that is 0.75 FL Oz/22ml. This is only used after cleansing. What it is is a cooling type mask that absorbs excess surface oil as well as purifies the skin. It can be used over the entire face and throat or just in the T-zone area. However your must avoid the eye area. The entire product except the mask must be used daily. I love this kit and would strongly recommend it to my friends who have similar problems. The price and size of this kit is great for people who would like to travel or tryout a new product. However I would say that the only thing missing from this kit is the toner. I love this all the products in this kit and have nothing bad to say about it. Overall this product is a 5/5.